In one year Rihanna successfully built one of the most talked about and profitable beauty brands. That’s not an easy feat in such an oversaturated market. So it’s no wonder that Allure chose Rihanna for the special Best of Beauty 2018 issue. 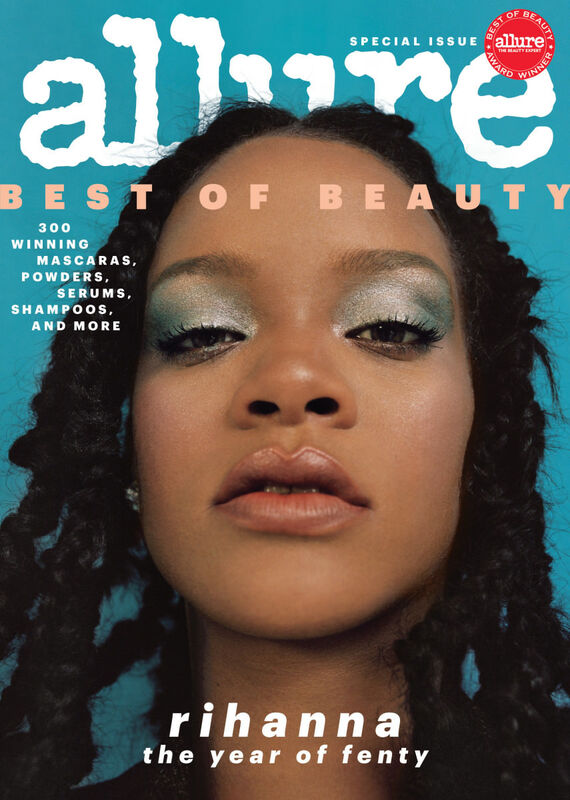 The issue features letters to the Fenty Beauty founder and gorgeous photos of her sporting the diverse products along with some great high fashion. 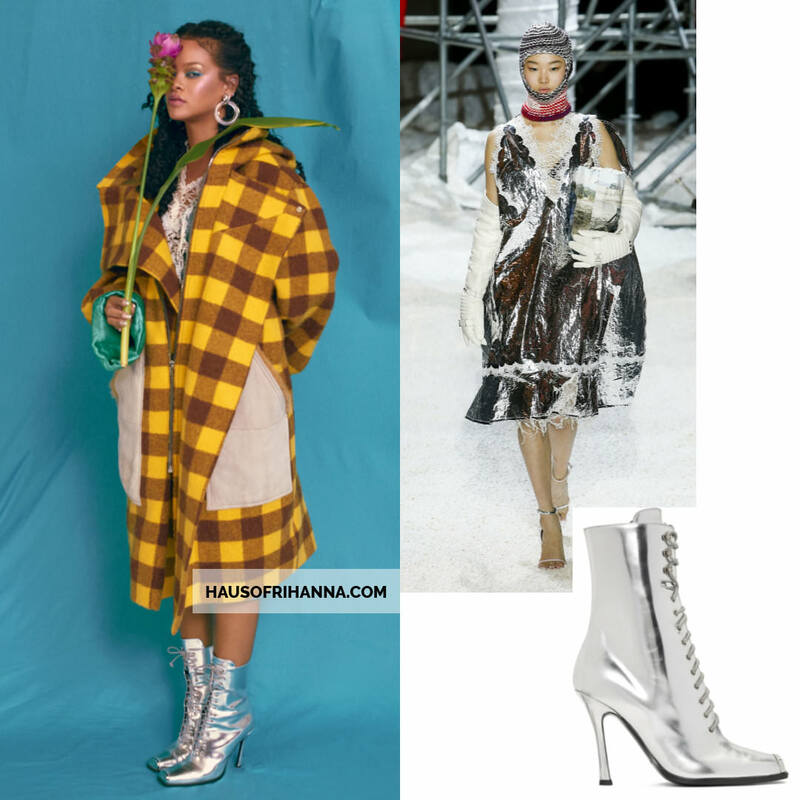 Rihanna’s longtime creative director and stylist Jahleel Weaver worked on this shoot along with other valued members of the star’s style team. Those are Yusef Williams on hair, Priscilla Ono on makeup and Maria Salandra on nails. 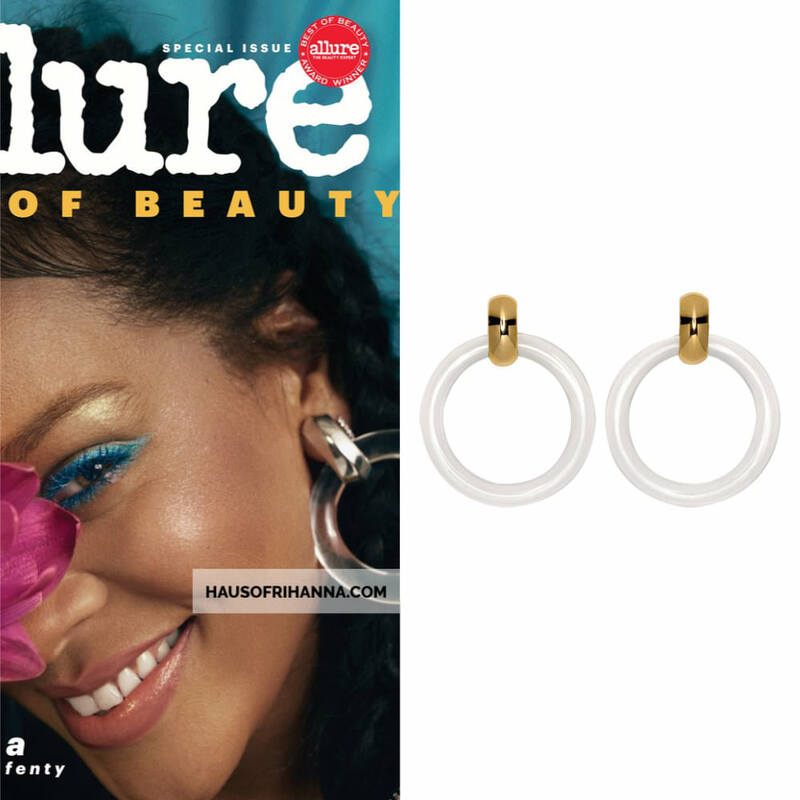 On one of the covers Rih sports a pair of Kenneth Jay Lane‘s clear doorknocker clip earrings ($75). They feature a 2.75″ ring. The other earring is Maria Tash. 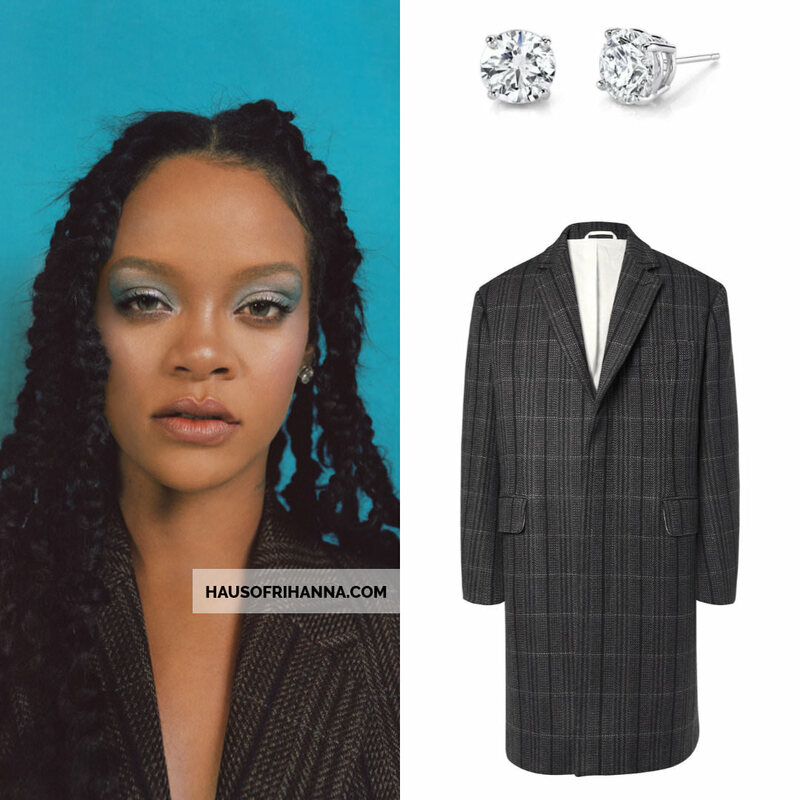 Next the Barbadian beauty wears a pair of Harry Kotlar diamond stud earrings with a Calvin Klein Fall/Winter 2018 coat. The oversized wool and silk coat ($2,900) boasts a cotton lining, a checked pattern and a hidden button closure. 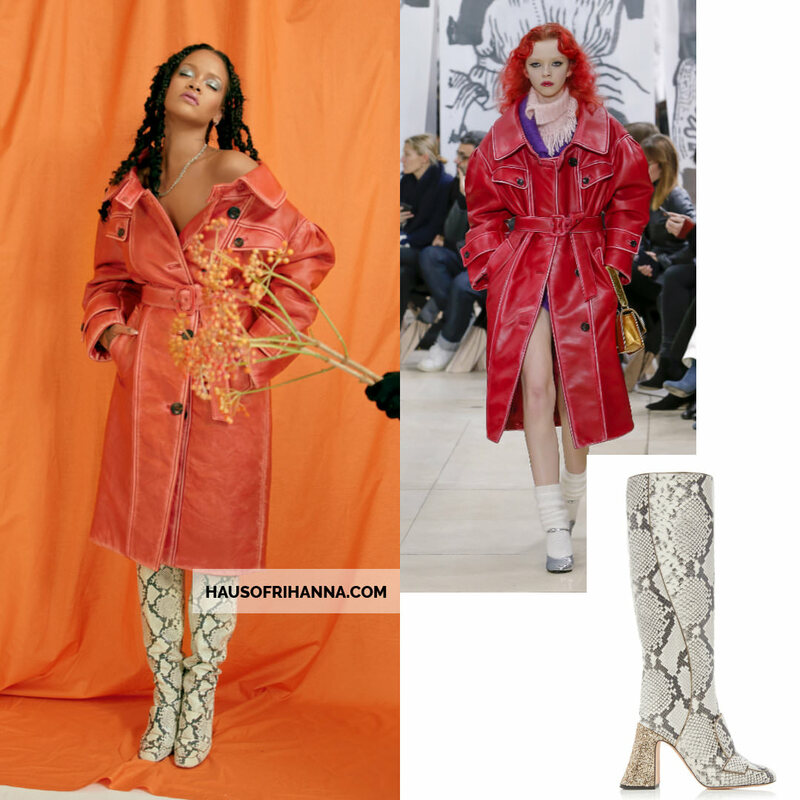 Here she rocks a red coat from Miu Miu‘s Fall/Winter 2018 collection that features large black buttons along with Rochas‘ Fall ’18 Pascal snakeskin boots ($1,284). The boots have a glitter heel and pink lining. Her jewelry includes a Maria Tash earring and Chrome Hearts necklace. In this shot she gets sparkly in Fenty Beauty’s diamond veil. The coat and plaid top are from Calvin Klein‘s Fall 2018 collection. The fireman coat features several clasps down the front, couture sleeves and reflective stripes. Get it now from Neiman Marcus for $2,950. 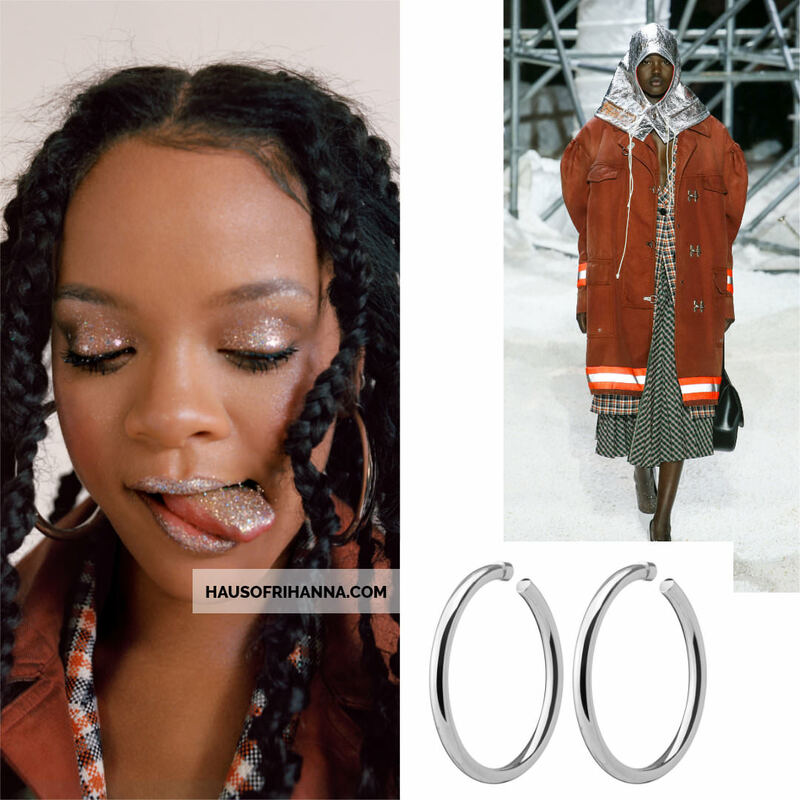 She also sports a silver pair of Jennifer Fisher‘s Samira hoop earrings ($550). 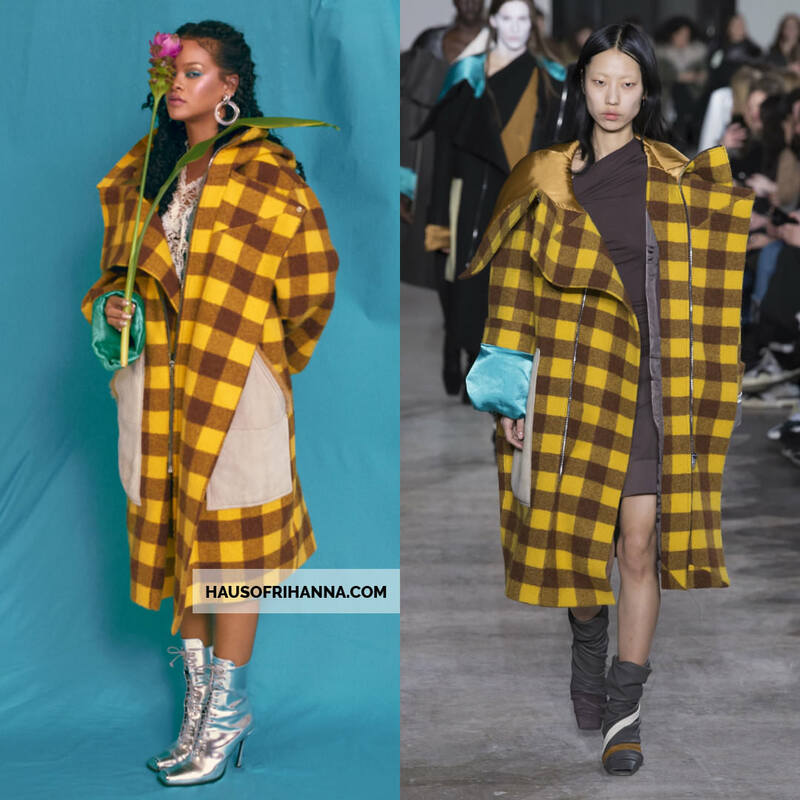 Above Rihanna wears a brown and yellow checkered coat from Rick Owens‘ Fall 2018 collection. It boasts a relaxed fit, turquoise lining, zip front closure and exaggerated collar. Underneath the coat is a silver Calvin Klein dress trimmed in white lace. She also rocks a pair of the brand’s Windora lace-up ankle boots ($1,290). The mirrored leather shoes have a square toe. Her earrings are the aforementioned Kenneth Jay Lane doorknocker earrings ($75) and small Maria Tash hoop earring. 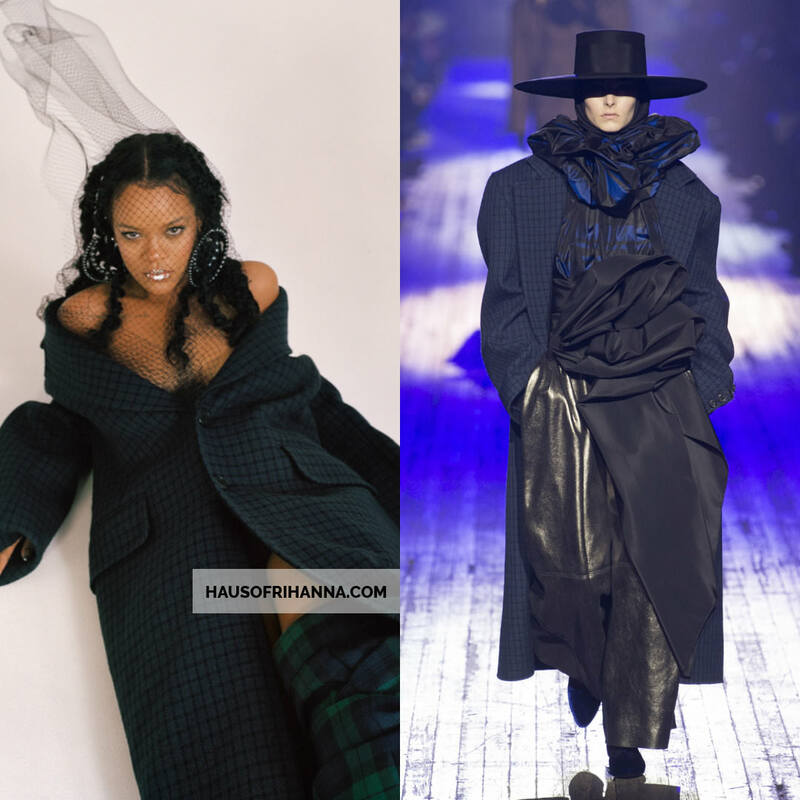 Next Rihanna reclines in a Marc Jacobs Fall/Winter 2018 coat. That entire collection features pronounced shoulders and oversized fits. Anytime Rihanna wears Y/Project it is a moment. 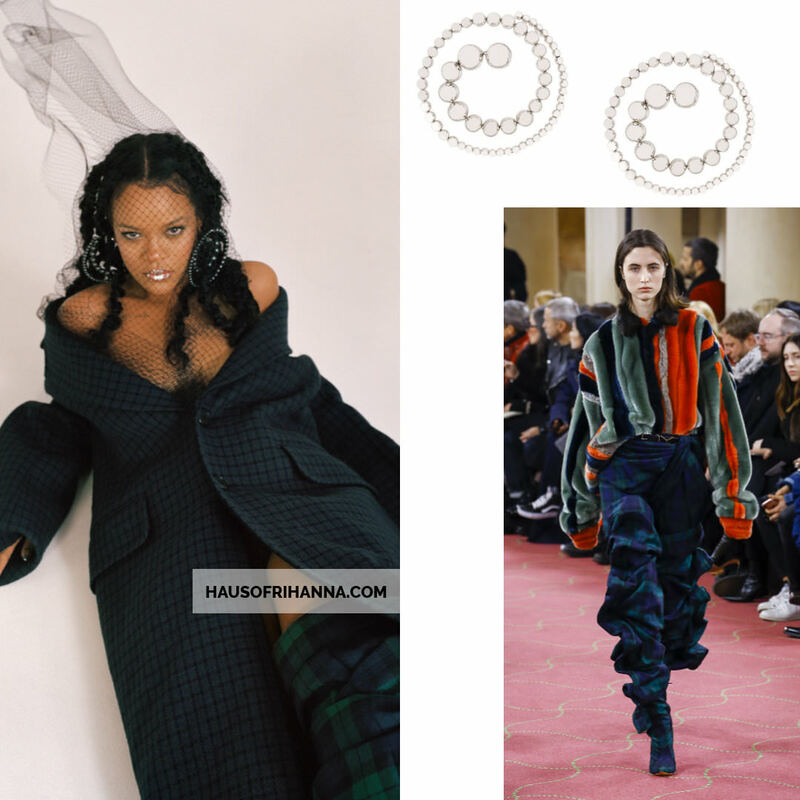 Here we have her in a pair of the brand’s spiral pearl earrings and the slouchy thigh-high plaid boots from the Fall 2018 collection. 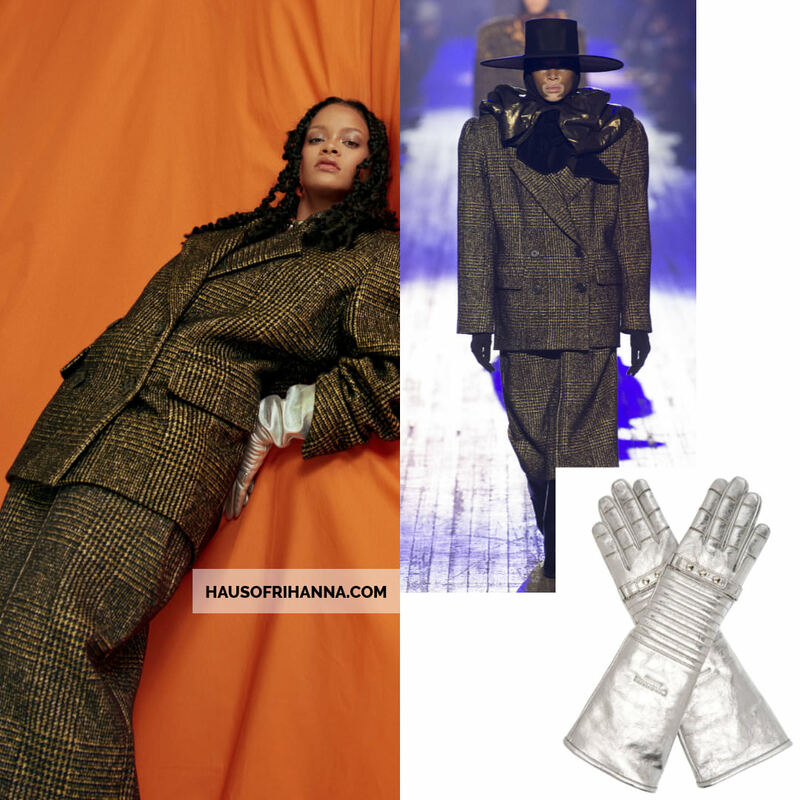 Finally, Rihanna dons a Fall 2018 pantsuit by Marc Jacobs and a pair of padded silver gloves ($790) by Calvin Klein.